I’ve been to Ocean City, MD several times for a conference that takes place in the off season, but I recently went for a friend’s bachelorette party. We went up on Friday and came back on Sunday (driving “up and around” so as to avoid the Bay Bridge – definitely helped on Friday, but it didn’t save much, if any, time on Sunday.) While there, we hung out at the beach, went to a few places that were new to me, and to my favorite spot. Friday night we managed to get a table at Liquid Assets, a fantastic gastropub that’s very close to the hotel where the conference is held. It was far busier than when I’m usually there, so we were initially told it’d be an hour wait. So we got a round of drinks, scored a corner of a couch and a bit of coffee table, and ordered some appetizers. But our wait was pretty short. We were seated at the table that was supposed to go to a group sitting near us at the bar – but someone in their party was running late enough that they lost it. We had breakfast in on Saturday, and lunch was sandwiches on the beach. We followed up with a cheese plate snack while we all rotated in and out of the showers and got ready for dinner at The Shark on the Harbor. This was a lovely restaurant with wonderful food and drink options. It’s tucked away, but was still super busy. After that we went to Seacrets, which is a giant nightclub complex. 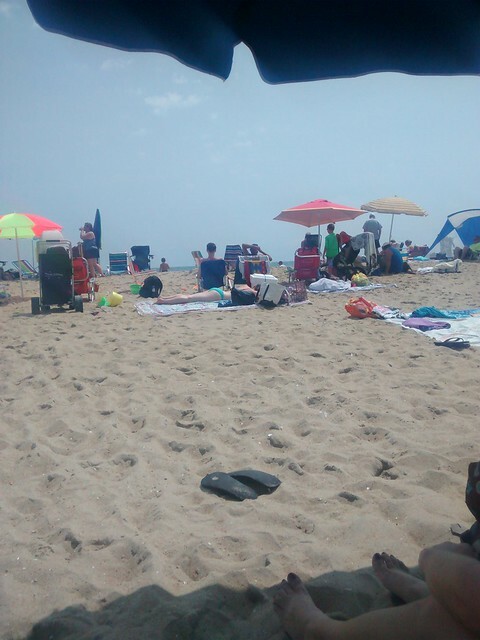 As it is at the beach, much of it is outside, so it wasn’t as loud and crowded as I was braced for. We also went to another place (very briefly) called Macky’s which was exactly as loud and crowded as I had expected. Like, you can barely move crowded. Neither is really my scene. What was right up my alley, however, was the 1am ice cream & french fries stop at the Dumser’s that’s right by the driveway to Seacrets. Sunday morning after we got ourselves cleaned up and backed up, we had brunch at The Bayside Skillet, which does omelettes and crepes. I got an omelette, which was fine. It was seriously underseasoned, to the point where I wonder if they are one of those places that just doesn’t put salt in anything. It came with a crepe, which I came to wish was what I ordered. Overall it was OK, but I wouldn’t seek it out. I wanted pancakes or a fried egg platter or something. Overall it was a very fun weekend, and I’m glad I got a chance to go to OC on such a perfect beach weekend, in my opinion. Very comfortable to be outside, as opposed to the usual Maryland heat and humidity.